I've been enjoying a visit from my sister and her family this week. They came into town to see my daughter's award ceremony today. This morning I arrived early to school in order to save seats. My sister came later and asked the receptionist directions to the gym. The receptionist took one look at her and freaked out. "You look just like her!" she squealed. "It's like you're twins." "We are twins," my sister said, laughing (the identical laugh which only compounded the freaking). The receptionist reprimanded me later for not warning her (sorry, I forget). But at least now she knows how I'd look with long hair. All this visiting, reading, painting and freaking people out with our look-alike-ness has kept me from blogging. We did, however, reminisce about childhood memories which inspired a story for the Highlights contest. Now I have my rough draft finished and I'm going to start revisions. Since I'm so far behind with housework and everything else (including my 1000 word/day count on my WIP), I'm going to take the rest of the week to unplug (learned about this from Diana). I'll still be checking in with your blogs and twitter because I miss you and my sister swears I'm addicted to blogging. What are you working on during Unplug Week? Enjoy being unplugged :) I hope you have a wonderfully productive time! When I was younger, I really wanted a twin sister (I think I was under the influence of 'The Parent Trap' and had visions of twinly hijinks, msaquerading as one another...). Unplugged week? Between the weather and computer wackiness, I've been inadvertently unplugged all week - now I don't feel quite so out of the loop, ha. A 1000 words a day - go you! Shannon, it's great to have sister time. I never seem to get enough. I always wanted to be a twin or have twins. Good luck editing for the rest of the week. According to my Mom, BEING a twin is easier than HAVING them. ;) Thanks Patti! Oooh, I love that graphic. I'm going to steal that for next month. I'm just...working. On what, I don't know, but the hours just slide by. I popped over here from Elle's blog. I loved your story. 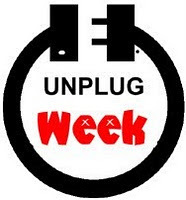 Have a happy unplug week! Bethany, glad you have you stop by! That's awesome that you and your sister are having a good time together. When I was little I used to wish I had a twin so much. As for unplugged week, I only just started blogging regurlarly last week. I can't possibly unplug now, I'm just getting started!! Have a great week and I hope you get a lot done! Kimberly, you're on a roll, keep going! unplugged week eh? Well that sounds like it may be a good idea. I could do to get back into my word count target that seems to have gone astray in the face of blogging, blog reading and twitter of late. Heather I agree. Maybe we should count all the words in our comments and posts for our word count. THanks for sortof unplugging just for mE! hee hee. I had so much fun with you!